At least three members of the six-nation Gulf Cooperation Council (GCC) have hinted they are likely to back a Saudi plan to transform the council into a diplomatic and military union. The London-based Al Hayat daily cited a senior GCC source who said Qatar and possibly Kuwait could join Bahrain and Saudi Arabia in announcing their intention to be part of the union core. "The union core announcement will mark the start of drawing up the details for the implementation of the union in the security, political, military and economic areas," the source said. 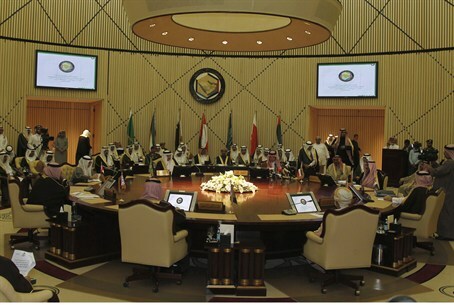 The GCC countries have demonstrated a strong unity in their political and security positions on the events in Bahrain and the standoff between the UAE and Iran on the UAE islands, the source said. “The bitter experiences in some of the GCC countries should be a strong motivation to join the union,” the source said. In December, Saudi King Abdullah Bin Abdul Aziz Al Saud, host of the latest GCC summit, called for moving the council from the stage of cooperation to the stage of union, within a single unity. The union, which would provide a strategic bulwark against rival Iran, would have centralized diplomatic and military arms while leaving domestic governance largely in the hands of its individual member states. Bahrain has since repeatedly said that it supported the call and that it looked for its formal announcement in Manama by the end of the year when it hosts the next annual summit. Reports at least three members are leaning towards Abdullah's plan came as leaders of Bahrain, Kuwait, Oman, Qatar, Saudi Arabia and the UAE will meet for one day in the Saudi capital Riyadh to discuss the latest developments in the region. An ad-hoc GCC committee created to guide the 31-year-old alliance towards union is also expected to deliver its first report. Saudi Arabia – at dagger-points with Tehran as they vie for hegemony over the Persian Gulf region – has been extolling the merits of the union as a vital necessity to confront security threats, and meet emerging political and economic challenges. The six Sunni Arab monarchies of the GCC have charged that Shiite Persian Iran has sought to destabilize their regimes by provoking their indigenous Shiite communities to revolution during the Arab Spring. The call for union by Riyadh has been coupled with GCC moves to tighten relations with NATO, which plans to build a regional operations center in Kuwait City, and to expand the union to include all eight Sunni monarchies. In addition to eyeing Morocco and Jordan for membership – with Amman already in integration talks with the GCC – the council has considered inviting Egypt, the world's most popular Arab country, to join the union. Doing so would place the GCC – most of whose members have technically been at war with Israel since its inception in 1948 – on the borders of the Jewish state. How such a development would affect Jerusalem's treaties with Amman and Cairo, or its security outlook with an Arab super state to the south and east, remains unknown.